There has always been an attraction to the city of Toronto, even when I was living in Oshawa – some thirty miles away. A half hour away, as the crow flies. Or roughly an hour and a half, as the car crawls. A major magnet for me has been the movie industry. Toronto strives mightily to be seen as “Hollywood North”. And it does this by trying to run every single film that’s on the entertainment scene every weekend. As well as quite a few of the lesser known independent films. And of course there’s the annual Toronto International Film Festival. The place is richer because of the movie industry. Films that might not make it to Backwater, Ontario will get their début in the big city. I went to one independent movie this evening, called “Carlos”. It was about “Carlos the Jackal” – a well-known Venezuelan terrorist in the late 60’s to late mid-80s. The film was five and a half hours long, and it boasted two intermissions. A good thing, because I doubt anyone could manage to stay seated to watch a film for that long, straight through. Still, it was interesting. I only knew of The Jackal through what I’d read, and he was always presented as an amoral monster who set bombs and assassinated people right left and centre. Turns out he only killed those on the right. I had no idea he operated according to a set of Marxist principles. Which of course doesn’t make him any more appealing. It’s just that he wasn’t a nihilist. During the second intermission I exited the Bell Lightbox Theatre (a brand new film complex) and made my way down to a coffee shop at the street level, there to do a walk-by of their baked goods. I wasn’t going to actually buy anything. I didn’t need anything, really. But I bought some high-calorie crap anyway. But not to eat at the theatre. On the way back from the coffee shop, with two minutes to go until the end of intermission, I noticed a woman standing in the rain outside of a trendy restaurant. Her job, I think, was to try and entice customers into the establishment. She smiled at me and I grinned at her. Her face brightened. “No, I’m dressed for it. Overdressed really.” And she glanced down at her oversized winter coat. We started chatting. She wanted to know if I lived in the area. Turns out she likes films too. So we talked about that for a while. Right then I realized I couldn’t remember her name, even though she’d just told me. This happens all the time – and so that’s when the subject of my ADD came up. Anyway, we learned a lot about each other. She got to telling me all about her discussions with her mother about the Bible – and I started to smile, realizing that she was attempting to “witness” to me. For those who don’t know – that’s when a fundamentalist Christian tries to convince you that you need saving. She was subtle about it, of course. As animated as she was, she wasn’t about to put the whole subject in my face, as some have done – hell, as I used to do, I think. I smiled at her. “My favourite book in the Bible is the Book of Job”. Once again, she brightened visibly, pleased to “discover” a fellow fundie. It wasn’t true of course, but I didn’t disabuse of her of that notion. Not yet, anyway – there wasn’t enough time to get into it. I realized that intermission at the movie was many minutes long past. So we agreed to get together again at some point. There was nothing romantic about the exchange. Just an exchange of interest, and a realization that we could probably have a long conversation. I think, in this socially cold city where women tend not to look at men, in case one of them turns out to be a creep; where men don’t look at women for too long, in case they get taken for being a creep, our encounter was a nice change. The film was OK too. It held my interest. I’m not quite sure I’d recommend it to anyone else though. Unless you’d really like to know about Carlos. At the end of the film he was still a monster. And apparently still alive. Unfortunately. Don’t know if I’ll ever be comfortable with people who are excessively passionate about ideologies and ultra religious ideas. At this point I have no idea if Danielle is part of that crowd. It’ll be interesting to find out. Maybe I’m passionate about my own anti-ideology ideology. There’s a worrisome thought. I would never sit through a 5 hour movie — never! And I live in LALA Land where this is our industry! Never! I LOVED Lord of the Rings, but even that is 3 seperate movies..thank goodness! So, first bravo to that! You get big credit for sitting through a 5 hour film! Secondly, I give you credit for continuing to talk to Danielle and still considering a possible future encounter. I think I’m real bad in that the minute a guy spews religious leanings, I find myself running and running fiercely. The irony is, I don’t mind someone interested in religion, but to talk about it initially is always a red flag of it’s importance in someone’s life. And to me, that scares me ALWAYS. …but see, maybe you’ve taught me something new? Or maybe I just need me some coffee? You know, I think this was a first, when it comes to long movies. There was another excellent movie, an Italian film with English subtitles called “The Best of Youth” – it was six hours long, but the theatres split it into two separate showings, a week apart. I loved that movie so much that I saw it twice. It was that good. So I suppose that experience, plus the great critical reviews of “Carlos” (not to mention the subject matter) conditioned me into thinking I wouldn’t hate it. And I was right, though as mentioned, I wouldn’t recommend it necessarily to anyone else. As for Danielle….well unlike so many other fundamentalist Christians that I’ve met, she seemed quite open and honest. Normally I’m like you: the minute someone begins the Christian “you-need-to-be-saved-so-you-can-be-just-like-me” Happy Dance, I’m outta there. But she seemed fairly transparent, so I’m guessing and hoping we can have an honest conversation. It’ll be interesting to see. The great thing is that I have no investment; no real desire to take anything to a romantic level or anything. If, when we begin talking in earnest about this stuff she gets turned off….*shrug*. I haven’t lost anything. You know? Wolf-man! In answer to your question to yourself in the last paragraph, I say “yes, you are”. I think I would enjoy a 5-hour long movie about Carlos, tho I’m not sure if I could remain seated in a theatre for that long. Could I lay down, perhaps? If it weren’t for those two intermissions, I’d have been toast. Normally, there’s a spot in most two hours films where I’ll fall asleep. With this one though – I wasn’t even tempted. Not once. So that’s a good thing. The lady seemed bright and honest. There’s relig-dar and BS-dar. I know all about BS when it comes to religion, on account of I honestly spouted a lot of it when I was running in those circles. “Honest” in the sense that I truly believed my own BS – that religion automatically infers happiness forever. The ending of my marriage put the boots to that nonsense, and served as the beginning of an epiphany for me. After the self-imposed blinders came off I found I could barely stand to be around others who were still in it. I liked them, of course, and still do. I just could not stand the dogmatic patois anymore. Being divorced and not going to church automatically meant I was at best backslidden. The pity and the “I’ll pray for you so that your marriage gets healed” kind of got to me, and not in a good way. That, coupled with the new notion that there really is – I believe, in God’s eyes – no real “us versus them” when it comes to humanity, lowered my tolerance for religion in a huge way. Anyway, that’s another blog, I think. Danielle sounds nice and it should be interesting. I’m in the witness protection program, meaning whenever I see two guys in white shirts riding bicycles, I go the other way. And, I think the better witnesses for me are the words and actions of others. Speaking of Italian cinema, have you ever seen the film “The Best of Youth” (Ital: : La meglio gioventù)? If not, do yourself a favour and rent it if you can. It’s an amazing six hour film about an Italian family, but focuses on two brothers who grew up during the time of the Red Brigades. One becomes a police officer and the other a doctor. I can’t do it justice here. But let me say this: I saw it in the theatre, twice. That’s how it good it is. And I’ll see it again, too. The director of “Carlos” attended the screening of his film last night. During a question period afterward, he was asked why the phrase “The Jackal” never appeared in the film even once. His response: “The Jackal” was a term attached to Carlos by the British press, after a copy of “Day of the Jackal” was found on a table in his home. Evidently, Carlos had been reading it, and so the British tabloids decided, from that point onward to refer to him as “The Jackal”. None of his friends or criminal compatriots ever referred to him that way. Oh Wolf, I think you misunderstood me – am in personal religious witness protection program meaning I run from people who want to tell me what I already know. Re: Italian cinema – first and favorite film … “La strada” with Giulietta Masina. Will check out “Best of Youth” – thanks for heads up. I wonder where I came up with that Carlos info? I know about him. Scrambled brains. *laughing* I should have read your comment a little closer. You were clear – my imagination was not. Right away I could only imagine this mysterious woman with a somewhat shady past. There’s a lot of misinformation out there about Carlos. Before seeing the film I was certain the movie with Bruce Willis was an enlarged portrayal of him, too. All kidding aside, I like to hear what happens should you meet her when it’s not raining and you have another five-and-a half hours to spend observing Life in teh Big City. Just put it on my bucket list. Even though the Jays beat the Phillies with a Joe Carter walk-off homerun in game six of the World Series in ’93. Over . . . and . . . Out! 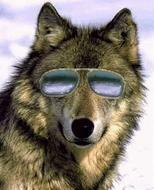 Really really like your idea of Wolfism as a new religion. Of course, if we do that, I’m going to have to excommunicate myself right away, because I don’t adhere to any religion. Sort of a Woody Allen thing, when you think about it. Normally I’m the same. Whatever I’m watching had better be rivetting if I’m going to be able to sit there to watch it for any length of time. I’ve actually gotten up from a few films and walked out half way through (and we’re talking about 90 minute movies here!) because they were too dull to keep my attention. So you have to know this one was OK. I mean, it held me there and I didn’t feel ripped off afterward. There’s another movie that’s six hours long, that I watched TWICE if you can believe that. What’s more – I’d see it again, too. No question about it. As mentioned in one or more of the comments above, it’s an Italian film (with English subtitles) called “The Best of Youth”. Simply put, it’s an amazing film. I can barely sit through a one hour TV show. Five hours in a movie theater sounds excruciating. I did watch two movies back-to-back once. I was in Hawaii, floating in the swimming pool with a drink in my hand and I could just paddle over to the mid-pool bar for a refill whenever I wanted one, drift under the waterfall and back out again, all the while the movie was playing on this gigantic poolside screen. That was awesome. I could have done it for a week! Don’t know if you’ve ever read anything by Gabriel Garcia Marquez; if you haven’t, he’s a Colombian novelist and winner of the Nobel prize in literature. His books are painful for me to read because they’re so abstract and surreal, so over-the-top and larger than life. ANYWAY, I let a friend talk me into going to see a movie based on one of his most painful books ever: Love in the Time of Cholera. Isn’t that a catchy title? My friend had sat riveted through The English Patient, so I knew she had incredible stamina when I came to movies, but even she was fidgeting by the time we were a quarter of the way through it. The theater was nearly empty so I started to experiment with how many different ways I could occupy my seat. I actually turned myself around, threw my legs over my seat back, and rested my head on the back of the seat in front of me but I got a crick in my neck, so that didn’t work. I did can-can legs over the top of the seat in front of me. I flailed like a toddler and even went “Kaa – Aye- aaaaate!” to my friend whose name also happens to be Kate. She made me sit through it and I did it because it was her birthday, but I was not happy. Anyway… Just had to share. As for your encounter with the girl. I wanted to put my hands over my eyes and read about it while peeking through my fingers. I have a bad feeling. There’s always this HOPE that fundies won’t end up being the stereotypical proselytizers we expect them to be, but, really, what kind of fundie doesn’t proselytize? I mean, it’s something they’re CALLED to do. By God. Remember Mark 16:15 and Matthew 28:19? You know how this is going to go. You KNOW. But you can’t resist poking at it, I know. Maybe she’s different. … Well, I suppose there’s a chance. People do win the lottery every now and then. Anyway, it was a pretty scene in my head until you got to the God part. I am a deeply spiritual person but fundamentalism of any kind scares me, and I do not want to be around anyone who seeks to convert or manipulate me. Doesn’t matter how good their intentions are. It turns me cold. I do know MANY wonderful Christians who don’t find the fundamentalist stereotype, but, then, they’ve never approached me as if to convert me either. Ok I just have to tell you – you got me literally laughing out loud with that scene you painted of you in the theatre. I can so vividly picture you, upside down and staring and trying your level best just to stay in that awful theatre. I get a feeling you probably related quite well to Christine on Jerry Seinfeld when she went to see The English Patient. I laugh every time I see that episode too – especialy when someone in the audience to tells her to keep her voice down and she yells back “Aw SHUT UP!”- and her boss fires her, and she’s just relieved because it means she can finally leave the damned theatre. On the other hand – I’ve GOT to know about that place in Hawaii, Kate. Tell me about it. Please. Was it at a hotel or something? I’m making notes over here. It sounds amazing. My tolerance for fundamentalism is growing, but only – as you say – because I get to poke at it now and then. And that’s fun for me. Oddly enough: I had a dream last night where my best friend from back in church days decided to have “the talk” with me. He was clearly disgruntled and was having a hard time trying to say what was on his mind. I grew exasperated and said “just come out with it, buddy. Say what’s on your mind. What’s your gut telling you?” I really wanted to engage, especially as he seemed so angry. And, having gone through all of this for so long, I knew I was well prepared for whatever he had to say. Unfortunately I woke up. But it made me wonder what could possibly have set him off (I was still half asleep and unaware that it was a dream). Then it hit me, in the moment of wakefulness – there’s a recent link on my FB page that he has access to which describes, in living colour, the way I think about God and fundamentalism right now. And so I know that if he saw it, there’s no way he wouldn’t be angry. I’m not really into making anyone angry or tromping on their beliefs. Well, much, anyway. But in a way I hope he played the video and got him thinking. I suppose too that when I meet next with Danielle, I’m hoping her mind is open to new thoughts, and that we can have a lot of dialogue. Otherwise, I’ll have to bite my tongue to keep from snickering. I’d rather talk than tolerate. Any day. I LOVED Seinfeld but I don’t remember that episode. I’ll have to look it up. I’m telling you, Love in the Time of Cholera makes The English Patient seem like an action adventure flick. I told Kate that she had damn well better get me something SPECTACULAR for my birthday to make up for having made me sit through that long, boring, I’d-rather-pull-my-fingernails-off-one-by-one than-watch-this-movie movie. I’m having difficultly leaving Hawaii. Give me a moment. You know that I lost nearly all of my friends when I left the church. There are many with whom I have managed to maintain a casual acquaintance, but those acquaintanceships are fragile things. I’ve been deleted on fb many times because my sense of humor is “inappropriate” or because I make honest statements about my beliefs. You know me; I’m polite. I’m not crude. I believe those folks were just looking for an excuse. It’s like I was part of this elite member’s only club and I’ve been ousted. I get zero joy out of upsetting people when it comes to issues of faith and spirituality. It’s just not me. I LOVE and crave honest, passionate dialogue but I go out of my way to be respectful, to listen just as carefully as I wish to be heard. Unfortunately, when people believe they already hold the truth they’re not willing to listen… I get it. I used to be proud of my closed-mindedness. I thought, well, YOU can be open-minded and you SHOULD, because you’re lost but I AM FOUND and there’s no reason for me to listen to you, so SHUT UP and let me get you saved brother/sister. I was well intentioned, no doubt, but, really, how awful. More than anything, I just want people to THINK. That’s all. I want to think with them. I’m on this journey of discovery, learning just how much little I know, that’s all. As for Danielle, who knows. What I meant to say in my original comment is that I know many wonderful Christians; we’re friends because they never tried to convert me. “I’d rather talk than tolerate.” ME TOO! Why is it so many of us don’t really want to think? Is our society overburdening us with data maybe? Maybe we just want to find a nice comfortable dogma and settle into it, without people ruffling our feathers. And maybe we’ll fight to the death our decision to hang onto it. Luckily, there are add-ons to the dogma that gives us the tools we need to fend off people who ask us to think: anyone who doesn’t believe as we do are obviously backslidden, or of the debbil. Or both. And it’s not that it’s the individual core beliefs that are wrong or anything – it’s the culture that surrounds it; the behaviours that result from that society.